I am crazy about scones! 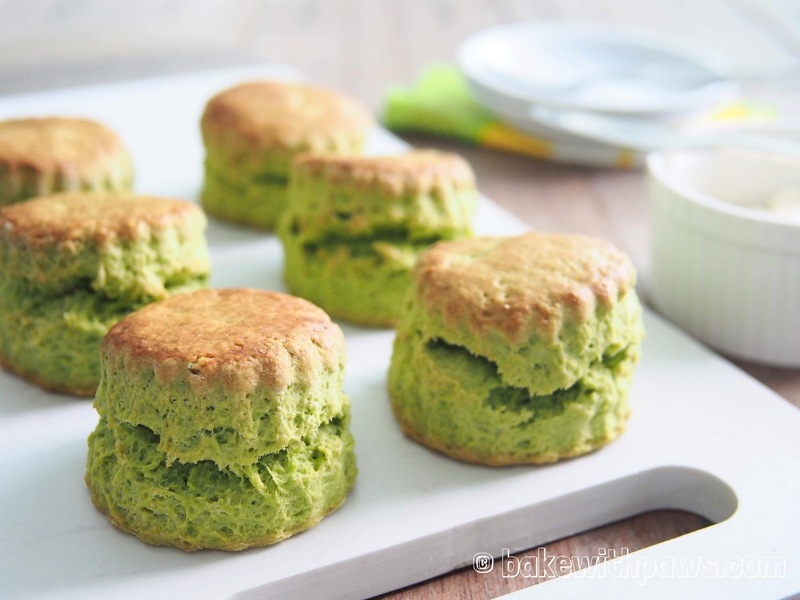 I suddenly had an idea to use some leftover pandan juice to make Pandan Scones. 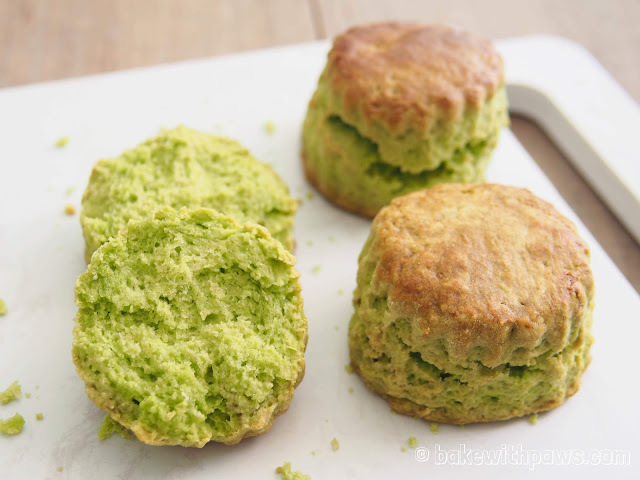 The pandan juice I used was very concentrated and the scones turned out super fragrant with a very nice vibrant green. They were of course delicious and fluffy! Traditionally, scones are served with clotted cream and fruit jam. Cut butter into few pieces and place the butter in freezer. Sift flour, baking powder and salt together in a large mixing bowl. Keep aside. In a small bowl, whisk egg with 26g buttermilk and pandan juice together. Set aside. Remove butter from freezer. Add butter into the flour mixture and use pastry blender to cut the butter until it looks like breadcrumbs. (If you do not have a pastry blender, use knife). Add egg mixture and mix with a spatula with cutting movement until all come together. If the dough seems too dry, add a little more buttermilk, a teaspoon at a time. Using hand, roughly make dough into a ball. Place the dough in the fridge for 10 – 15 minutes. Remove dough from the fridge. Turn it onto a lightly floured surface and roll it into a rectangle about ½ inch thick. Fold it into thirds like a letter. Repeat another time the same way. Roll the dough out to at least 1 inch (2.5cm) thick. Please do not roll it any thinner as we want to have well-risen scones. Click here to view the steps. Using a round cutter, cut scone from the dough. Please don’t twist it, just lift it up and push the dough out. 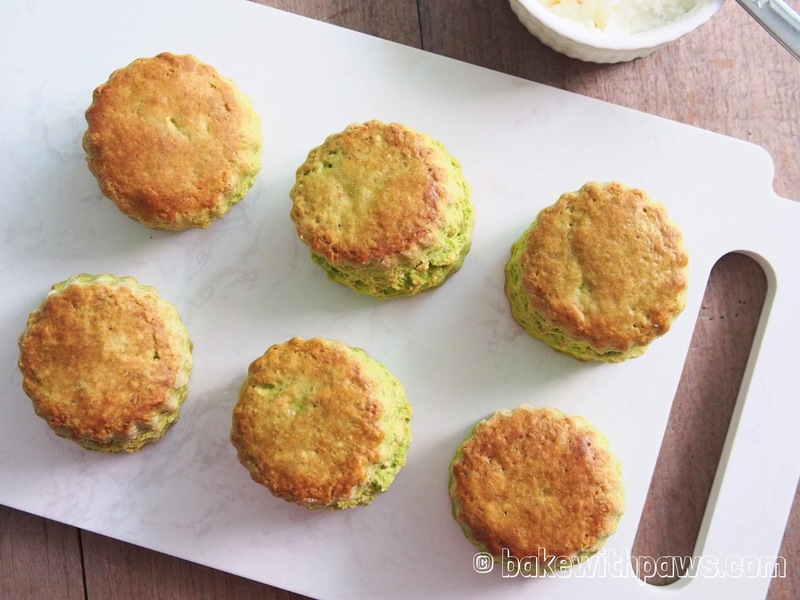 Place the scones on the lined baking tray, brush them lightly with buttermilk. Bake in the preheated oven for 10-15 minutes, or until golden brown and well-risen. To get puffy and flaky scone, make sure the butter and all wet ingredients must be very cold and try not to use hand mixing the ingredients. Thank you for stopping by and compliment.